Korowai/Torlesse Tussocklands Park covers approximately 21,000 hectares on the Torlesse and Big Ben Ranges, in Canterbury's high country. The Torlesse and Big Ben Ranges are a visible feature on the landscape from as far away as Christchurch and the Port Hills. Travellers on state highway 73 between Christchurch and the West Coast gain an increasingly panoramic view of the park as they approach Porters Pass. The Torlesse Gap is an outstanding visual feature on the horizon. Korowai/Torlesse Tussocklands Park is a key site for the promotion and protection of eastern South Island high country landscapes and ecosystems. The dual name indicates the importance of the area to our local and national culture. Korowai (a cloak) is symbolic of concepts such as embracement, collectiveness, togetherness and prestige. It recognises the historic connections the Ngãi Tahu tupuna (ancester) Tanetiki had with the area. Torlesse also connects people with the land, by using the name of the first European to have set foot on this mountain range. The Torlesse and Big Ben are high, dry mountain ranges with remarkable flora and fauna. Slim-leaved snow tussock/wì kura is common and high altitude tussock grasslands represent the eastern limit of mid-ribbed snow tussock. Some of the driest mountain beech/tawhairauriki forest and kãnuka shrublands of the region. Species-rich shrublands, containing broadleaf/kãpuka, Dracophyllum sp., matagouri, Coprosma propinqua and the endangered Hebe cupressoides. 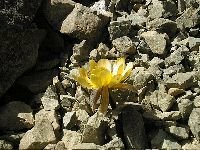 Unusual plants and animals adapted to the unstable screes and rock ridges, such as vegetable sheep (Raoulia eximia), South Island edelweiss (Leucogenes grandiceps), penwiper/poprtaka (Ranunculus haastii), scree lobelia (Lobelia roughii). Some of the best populations of the vulnerable scree pea (Montigena novae zelandiae). Several species of mountain daisy/tíkumu (celmisia) carpet more stable slopes. Native grasshoppers, weta, cockroaches, lizards and butterflies. Kea, falcon/kãrearea and pipit/píhoihoi inhabit grasslands. Tomtit/miromiro, rifleman/títipounamu, brown creeper/pípipi present in the beech forests. 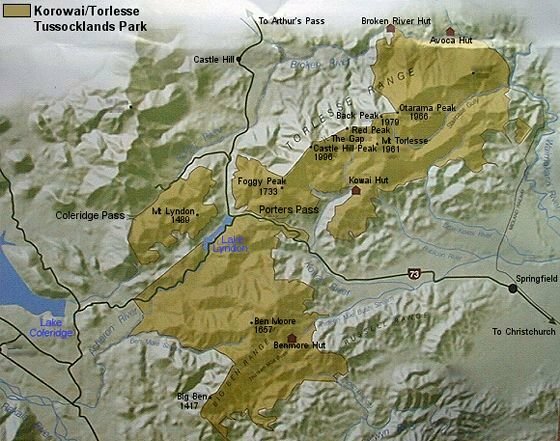 Mãori have a long association with the foothills and ranges within Korowai/Torlesse Tussocklands Park. From very early times, the area has held special significance for the first occupants the Waitaha, and through many generations to present day Ngãi Tahu. Cultural sites of special significance to Ngãi Tahu include the range itself (Otarama) and the Mãori trail through the Lake Lyndon Valley. The basins and ranges were an intergral part of a network of trails, which were used to ensure the safest seasonal journeys and best access to mahinga kai (food gathering places). Charles Torlesse, a surveyer for the Canterbury provisional government, led by Mãori guides in 1849, was the first European to climb the slopes of the range and gaze at the "romantic and chaotic mass of mountains to the westward". A few men with picks, shovels and a government grant of 500 pounds, made the first track over Porters Pass in 1858-9. The original road along which Cobb and Co Coaches climbed the southern flanks of the Torlesse Range is still visible within the conservation park boundaries. Other historic European sites within the park include the old pack track used by the Porter brothers, crossing Coleridge Pass to reach their homestead beside Porter River. The avoca Homestead (1907) and the Mt Torlesse Colleries Coal Mines, which operated from 1918 to 1927, are located in the park near Broken River. 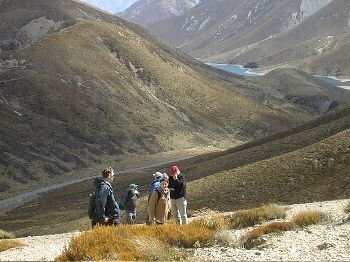 The Torlesse Range is one of the most accessible in the country, located alongside SH73, only 1¼ hours drive from Christchurch. The main access points into the park are the Kowai River (private), Porters Pass, Lake Lyndon Road, Grasmere/Craigieburn Road, and the Porter Heights Skifield Road. Access to some areas requires permission from neighbouring landholders. Winter climbing and cross-country skiing. Picnicking and boating on Lake Lyndon. Botanising, scientific research and natural history studies. There have been several long-term studies on mountain land stability in the park, and it is known as a type-location for many plants and animals. Many of the research sites remain important as internationally renowned benchmarks. Trig M from near Lake Lyndon, and via Coach Stream at the bottom of Porters Pass. This is also suitable for mountain biking. An unmarked route continues on to Rabbit Hill. The climb from Porters Pass up Foggy Peak, and beyond to Castle Hill Peak. Kowai River onto the Torlesse Range.